Global international removals and shipping specialist John Mason International has been helping customers become Kiwis for some time. But while people who move to New Zealand enjoy a warm welcome, a good economy and an enviable lifestyle, the poor kiwi bird is not faring quite so well. Although completely flightless, with its closest biological ancestors in Madagascar and Australia, the kiwi managed to defeat all the odds, put down permanent roots in New Zealand – and become the country’s emblem. Now it needs help, and John Mason International is stepping in. “This shy, nocturnal creature may be the face of this beautiful country but it’s at growing risk of extinction through man-made threats to its environment and natural predators too,” said John Mason International marketing director Simon Hood. “In areas of New Zealand not under special kiwi management, some 95% never reach breeding age. If the survival rate of kiwi chicks can be boosted to just 20%, the population would naturally increase, but as it currently stands the number of kiwi in the wild is dropping by 2% year-on-year. “John Mason International has partnered with Kiwis for Kiwi.Kiwis for kiwi is the national charity that is helping to protect these little characters who, despite their shortcomings, have fought to make New Zealand their home. 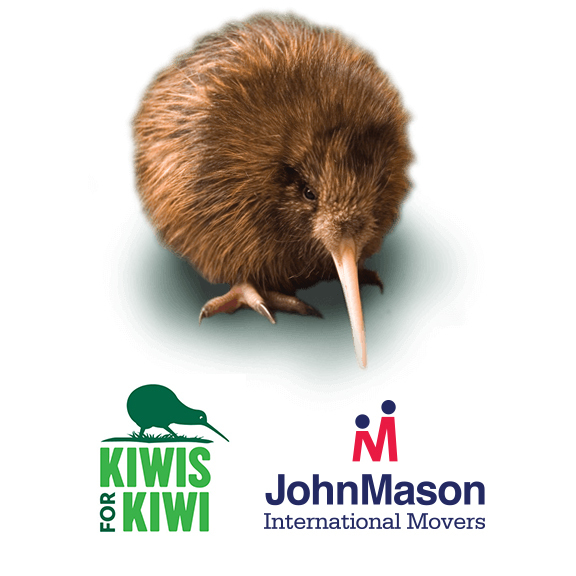 John Mason International will be supporting a Kiwi bird for every family we move to New Zealand, – steering it through the hazardous route to maturity and mating age. The promise of adopting a kiwi is a move that could help protect and grow the numbers of the country’s rare and endangered mascot. Customers who we move to New Zealand will receive a photo and be kept up to date with the kiwi’s progress. “The kiwi is an iconic symbol for New Zealand, part of its identity and its charm for the native population and for people settling here. The natives call themselves Kiwis, the currency Kiwis, the rugby team Kiwis. It would be a big problem if kiwi birds were to die out in our lifetime just because so few of these creatures get a chance to make their own move and mate!